When Kurt graduated from the University of Massachusetts at Amherst in 1991 with a degree in Landscape Architecture, he worked, as an architect for 9 years before it became clear “corporate America” was not for him. It was then that his journey towards art began. In his current collection you can see the creative journey from the first pieces up to the newest pieces. The beginning artwork was more representational, showing precise details and keeping it true to the actual scenes. As he progressed, his art became more painterly and loose. He experiments with color undercoats and textured surfaces while trying different techniques with washes and layers of pastels. Kurt’s success as an artist includes national and international awards for his paintings, while having been featured in Artist Magazine, Horticulture Magazine and The 2010 Best of Worldwide Landscape Artists Book. 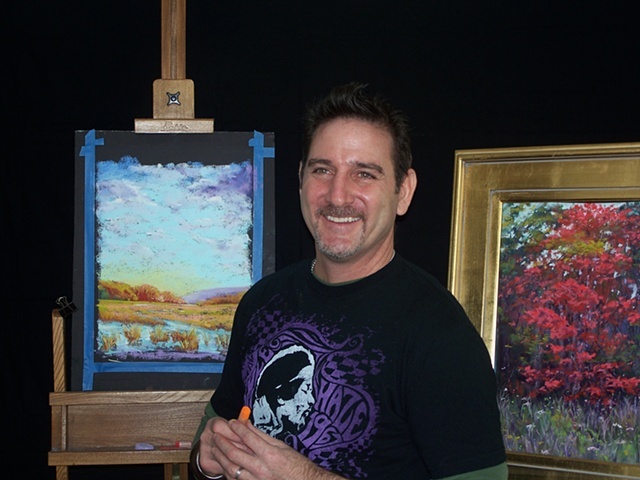 He holds the prestigious status of Signature Member in the Master’s Circle of the International Association of Pastel Societies along with Signature Memberships in the Pastel Society of America, Connecticut Pastel Society and Pastel Painters Society of Cape Cod. An Active Membership in the Degas Pastel Society, and current President of the Piedmont Pastel Society in Charlotte, NC.